Danny Lipford on the set with “America’s Morning Headquarters” hosts Anaridis Rodriguez, Stephanie Abrams and Reynolds Wolf. Danny Lipford visits The Weather Channel as a special guest on the morning show, America’s Morning Headquarters, as part of their “Fall Around America” coverage. Seal the envelope of the home with inexpensive DIY products, such as weatherstripping, interior and exterior caulk, and Duck Brand’s Roll-On Window Kit and Socket Sealers. Inspect the roof and clear off all debris; clean gutters and downspouts. 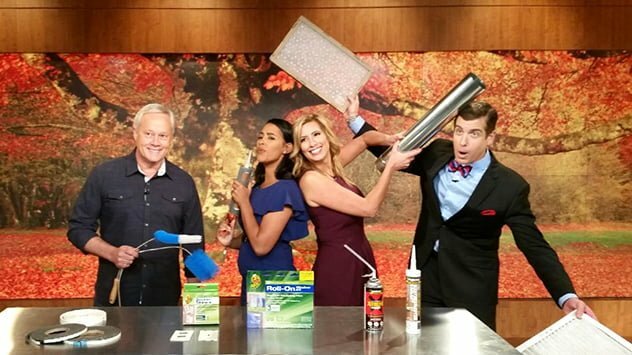 See more from Danny’s visit to The Weather Channel with De-bunking Common Home Maintenance Myths.